Star Warz is thé event of choice of all leading Drum ‘n’ Bass labels around the world to showcase their talent in Belgium. It is also Tomorrowland’s event of choice to showcase Drum ‘n’ Bass on the best festival of the world. What more do we need to say? Ram Records was established by Andy C and Ant Miles in the summer of 1992. Boldly placing itself at the very forefront of a genre that didn’t even exist, Ram has played a consistently dominant role in the foundation and continuous development of Drum ‘n’ Bass ever since. Now over 20 years deep and Ram Records is no longer just at the very forefront of Drum ‘n’ Bass but electronic music at large. Its artists dominate the many multi-genre line-ups at the best events around the world. And its output, while still predominantly 170BPM, reflects the rude state of creative health dance music is enjoying: boundaries have blurred, rules are broken and as the dance-floor’s many facets and flavors continue to morph, mutate and melt, one thing remains sure… Ram will always be leading the charge. And RAM will also be leading this new edition of Star Warz. We’ve had the head honcho over on several occasions, now he wanted his best talents of the moment to experience the Star Warz madness so here they are ..
To Drum ‘n’ Bass fans the world over, the names Calyx and TeeBee are synonymous with high quality and perfectly sculpted music. Just as Michelangelo discovered statues in blocks of stone, so Calyx and TeeBee discovered the essence of D&B locked away in studio equipment; always forward-thinking and packed with as much integrity as energy; their music has had an impact on the scene for over fifteen years and their 2012 album ‘All or Nothing’ on RAM Records remains one of the most awarded albums in years. No other producer packs a punch like Audio. From his tattooed Drum ‘n’ Bass knuckles to his ruthlessly hard-hitting productions, Gareth Greenall embodies the spirit of D&B. Uncompromising, inherently underground and refusing to play games, the South London artist’s diligence, creativity and lack of complacency has inspired mass respect from every possible corner of the scene. Four albums, countless 12”s and over 15 years deep into his limit-pushing adventures, Gareth continues to surge at the very forefront of the sound. 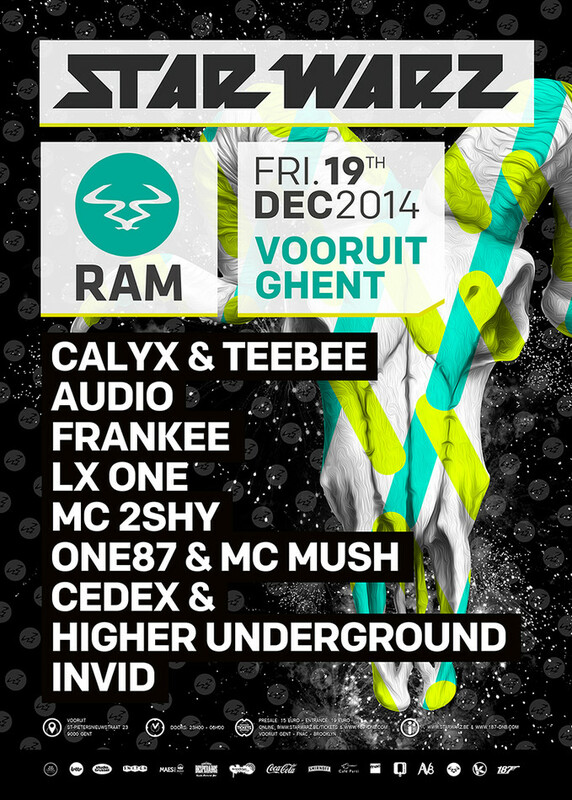 After two amazing albums on Virus, he’s now an intrinsic part of RAM. David Franks otherwise known as Frankee is part of a new wave of producers to hit the scene in recent times. Although a new face to many, Frankee's history spans back more than a decade of dedication and hard graft from when he was first introduced to Drum & Bass via his older brother at the age of 13. After several 12” on RAM Records sister-label Program, he has now been signed to RAM also and we’re looking forward to discovering his talent! Backed up by their MC’s of choice and steady values at nights as Fabric Live and Metalheadz, LX One & MC 2SHY will be spitting the lyrics your way. With full support of Star Warz resident One87, backed up by MC Mush and local talents as Cedex & Underground & Invid, Star Warz is completely ready to blow you off your socks once again!